The Solar Wind Continues To Blow: For the 3rd day in a row, Earth remains inside a stream of high-speed solar wind flowing from a canyon-shaped hole in the sun’s atmosphere. NOAA forecasters say there is a 40% chance of minor G1-class geomagnetic storms on Oct. 9th as our planet’s magnetic field is buffeted by the gaseous material. 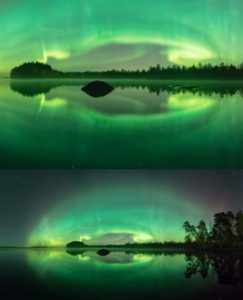 Aquatic Auroras: On Oct. 7th, a stream of solar wind hit Earth’s magnetic field, sparking G1-class geomagnetic storms for more than 9 consecutive hours. Matti Helin watched the storm’s green glow from an unusual position. “I was wading waist deep in a Finnish lake,” he says.